El Corte Inglés S.A. (Spanish pronunciation: [el ˈkoɾte iŋˈɡles]; Spanish for "the English cut"), headquartered in Madrid, is the biggest department store group in Europe and ranks third worldwide. El Corte Inglés is Spain's only remaining department store chain. In 1934, the founders Ramón Areces Rodriguez and Cesar Rodriguez Gonzalez bought a tailor shop (which had opened in 1890) located on one of Madrid's most central streets, calle Preciados, and made it into a limited company. Around 1920, aged 15, Areces had gone to Havana, Cuba, and worked at the famous retail chain Almacenes El Encanto, where he learned the basics of department store business. In 1940, he turned the tailor shop into the current corporation El Corte Inglés, S.A.. On the death of Areces in 1989, his nephews, Isidoro Álvarez, who later became the president, Luis Areces Rodriguez and David Gonzalez Fernandez were named his successors and quickly became some of the most powerful men in Spain. In 1995, El Corte Inglés bought out its only serious competitor, Galerías Preciados, which had entered bankruptcy. Stores tend to be very large in size and offer a wide range of products: stores may sell music, movies, portable and household electronics, furniture, hardware, books, clothes, groceries, gourmet food, cars and real estate. International expansion began in 2001 in Portugal, with a store in Lisbon, followed in 2006 with a store in Vila Nova de Gaia, opposite the city of Porto, and a third store was planned. In that same year of 2006 just as it opened its second store outside of Spain (in Vila Nova de Gaia) the company announced expansion outside the Iberian Peninsula: Italy was to be the first country to host a store but, owing to the ongoing eurozone crisis, the plan was suspended, as well as the opening of the third store in Portugal. In 2009, David Gonzalez Fernandez, one of Cesar Rodriguez's descendants sold his 9% of stake to the company right after the Areces Fuentes Brothers sold their 3%. In October 2013, the firm sold a 51% stake in the financing department to Spanish banking group Grupo Santander for around €140 million. From 2014 to 2018 the CEO of the company was Dimas Gimeno. El Corte Inglés' flagship store is located in Madrid at 79 Calle Raimundo Fernández Villaverde. The complex encompasses several buildings and carries the most comprehensive collection of designers of any large store in Spain. Designer boutiques in this store include: Hermès, Louis Vuitton, Cartier, Armani, Armani Jeans, Armani Collezioni, Gucci, Loewe, Dockers, Ralph Lauren, Bulgari, Dior, Dior Homme, Georges Rech, Versace, Hugo Boss, Boss Woman, Ermenegildo Zegna, Tommy Hilfiger, Dolce&Gabbana, Burberry (men/women), Façonnable, Pal Zileri, Paul & Shark, Lacoste, Pavillon Christofle, CH by Carolina Herrera, Escada Sport, James Purdey and Sons, Lloyd's, Purificación Garcia, Calvin Klein, Caroll Paris, Amitie, Episode, store brands (Emidio Tucci, Dustin) and many others. Also included is a branch of the Madrid-based Aldeo jewelers, carrying such jewellery designers as Boucheron, Blancpain and Hamilton. El Corte Inglés at AZCA (Torre Titania), in Madrid. On 23 April 2013, the eight-story Rana Plaza commercial building collapsed in Savar, a sub-district near Dhaka, the capital of Bangladesh. At least 1,127 people died and over 2,438 were injured. The factory housed a number of separate garment factories employing around 5,000 people, several shops, and a bank and manufactured apparel for brands including the Benetton Group, Joe Fresh, The Children's Place, Primark, Monsoon, and DressBarn. Of the 29 brands identified as having sourced products from the Rana Plaza factories, only 9 attended meetings held in November 2013 to agree a proposal on compensation to the victims. Several companies refused to sign including Walmart, Carrefour, Mango, Auchan and Kik. The agreement was signed by Primark, Loblaw, Bonmarche and El Corte Inglés. ^ "Corporate Information". Retrieved 31 January 2019. ^ "Home." El Corte Inglés Corporate. Retrieved on December 17, 2010. "El Corte Inglés, S.A. Hermosilla, 112. 28009 Madrid." ^ "El Corte Inglés rises to the world podium of department stores". Retrieved 31 January 2019. ^ "DGAP-Media: JAXX subsidiary Serviapuestas signs exclusive deal with Europe's largest retail group El Corte Inglés". Retrieved 3 June 2017. ^ País, Ediciones El (2 August 1989). "Isidoro Álvarez asume la presidencia de El Corte Inglés y de la Fundación Ramón Areces". Retrieved 3 June 2017. 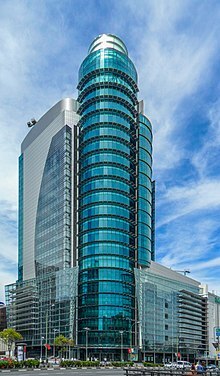 ^ "El Corte Inglés - información corporativa". www.elcorteingles.es. Retrieved 3 June 2017. ^ Press, Europa (10 December 2009). "César Areces estudia demandar a El Corte Inglés por pagar un 30% más a otro heredero por sus acciones". Retrieved 3 June 2017. ^ Carlos Ruano (8 October 2013). "Spain's Santander to buy 51 percent of El Corte Inglés finance arm". Reuters. 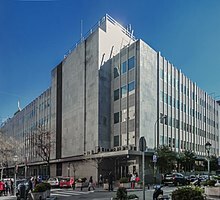 Wikimedia Commons has media related to El Corte Inglés.